Farms to find failure to fix broken levees before snows causing headaches for those most affected. KANSAS CITY, Mo. (AP) — Midwestern farmers who saw their land swamped by summer flooding may be socked again with steep increases in their crop insurance premiums, the expensive result of the failure to fix broken levees before the winter snow and next spring's rains. The Missouri River rose to record levels this year after the U.S. Army Corps of Engineers began releasing massive amounts of water from reservoirs in Montana, Nebraska and the Dakotas that had been inundated with melting snow and heavy rains. 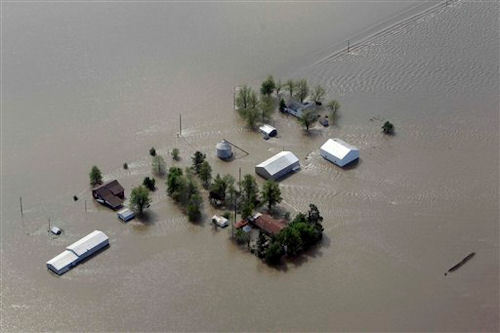 Many levees in downstream states such as Iowa and Missouri were no match for weeks of sustained pressure and gave way. Homes and farms were damaged or ruined. USDA's Risk Management Agency said $114 million in claims have been paid so far for flooding damage on 436,000 acres along the Missouri River downstream from the Gavins Point Dam on the Nebraska-South Dakota border. Record high water levels also created havoc along the lower Mississippi River from Missouri to Louisiana. In southeast Missouri, the corps used explosives to blow gaping holes in the Birds Point levee to let water out of the Mississippi River and save the tiny town of Cairo, Ill., on the river's eastern bank. The blast sent water cascading over Missouri farms. The deluge flooded about 130,000 acres behind the levee, including about 8,000 on which Ed Marshall, 55, of Charleston, grows corn, wheat and soybeans. He received $1.5 million in federally-subsidized crop insurance, which covers part of farmers' losses from such things as drought, flooding, hail, wind, insects and plant disease. Then his farm premium skyrocketed. He recently paid about $100,000 to insure about 2,700 acres of wheat that he planted in the fall and hopes to harvest in the spring. The amount is nearly five times what he paid a year ago because the U.S. Department of Agriculture now considers his land high risk and he increased his coverage because of the risk. Marshall, like many farmers, feels like the government has left him high and dry. "You are going to blow my levee up and then you are going to turn around and take more money from me for insurance because I don't have a levee because you all blew it up," he said. "There is nothing right about that in my opinion." The higher premium is worth it, given that Marshall expects to earn $1 million from the wheat. But the rise in insurance costs "is almost adding insult to injury to farmers who lost their crops this year," said Kathy Kunkel, the clerk in Holt County on the opposite side of the state, where the Missouri River flooded more than 120,000 acres and 32 levees were breached. Insurance is a regular cost of doing business, but "this is going to put some people out of business," she added. Officials with the USDA's Risk Management Agency began warning farmers of potential rate increases over the summer because they didn't want them to be shocked when the 2012 rates were announced last month, said Rebecca Davis, a spokeswoman for the agency. "We had a lot of public meetings and at those meetings I said, 'We have to recognize that this levee is no longer there. And if it doesn't get repaired by the time that the insurance attaches, we have to recognize that it is a higher risk,'" Davis said. "We tried to let them know as early as possible." It can be two to three times more expensive to insure farmland behind damaged levees than those where repairs have been made. Some farmers, like Marshall, have already paid the higher rates for crops planted this fall. Others will pay unless repairs are made before crops like corn and soybeans are planted in the spring. Along with the Birds Point area, the higher rates could apply in 22 counties in Illinois, Iowa, Kansas, Louisiana, Missouri, Nebraska and Tennessee. The corps has estimated it will cost more than $2 billion to repair damage this year's flooding did to levees, dams and riverbanks. With a funding bill stalled in Congress, the corps has been focusing its limited money on fixing levees that protect communities and facilities such as water treatment plants. "We are not going to have them all fixed," said Jody Farhat, chief of the Missouri River Basin Water Management office. "The (levees) that we are working on because the funding is limited won't be restored to their pre-flood conditions. And there are many that we won't even have money to start the repairs." Farmers also must restore their soil to pre-flood conditions to get their insurance rates back down. Flooding often cuts massive ruts in the land, washes top soil away and leaves sand from the river bed, which isn't good for farming. The cleanup is costly. Marshall said he spent $270,000 to clean ditches and clear 200 acres of land. He figures it will cost another $300,000 to fix another 200 acres that were badly damaged. If the corps can't take care of the levee repairs, it should help farmers pay the higher insurance premiums, Missouri Farm Bureau President Blake Hurst said. "It's a mess," he said. "These folks have lost their homes. They've lost their grain bins, they've lost their implement sheds, they've lost a year's crop. They have a tremendous amount of damage to the land from both scouring and sand deposits. And now they are looking at an increase in insurance premiums. Something has got to be done." The levee at Birds Point was 62.5 feet high before the explosion. Generally levees must be restored to their pre-flooding condition, but in the case of Birds Point, farmers won't face big premium increases if the corps gets it back up to 55 feet before spring planting. Marshall said the rebuilding has been going slowly. "They had a plan to destroy it," he said, "but not a plan to fix."